We are proud to announce that Cielo Homeowners Association has selected Tinnelly Law Group as their associations’ legal counsel. Located in Rancho Santa Fe, Cielo inhabits one of the highest vantage points with elevations reaching over 1,450 feet. Many of the luxurious custom built homes and home sites have fabulous views of the surrounding mountains, the Pacific Ocean and south towards the Coronado Islands. It is surrounded by pristine and dedicated open space which adds to the appeal and privacy of the community. Residents enjoy first class amenities including Club Cielo with catering facilites, a community park, fitness center, competition-sized pool, a children’s pool and play area, a spa, two tennis courts and much more. 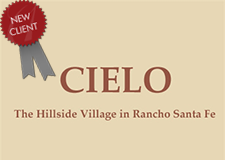 Our HOA attorneys and staff look forward to working with Cielo’s Board and management.